HTC has been in the rumor rounds for a while now about the launch of its upcoming flagship HTC M10 (Perfume). Recently, there were also few reports suggesting that the HTC One M10 will not be unveiled at the MWC 2016 event, and the company will launch the smartphone in a separate event. 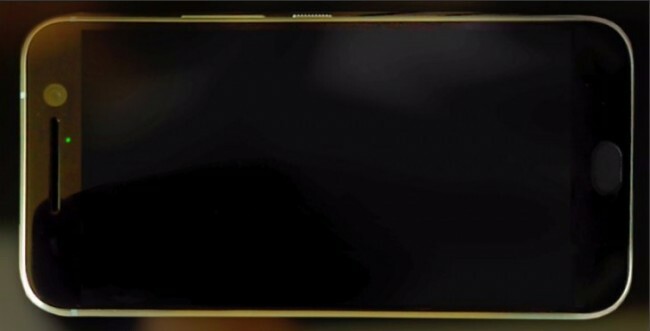 Today, a live image of the upcoming flagship smartphone has been leaked by the popular leakster Evan Blass on his official Twitter handle showing the design of the device. As per the leaked image, the HTC One M10 will come with an entirely different design when compared to the HTC One M9. The smartphone will sport all-metal body and its design mostly resembles the recently launched HTC One A9. The One M10 also sports a physical home button on the front of the device but is slightly smaller when compared to the One A9. The company has also removed the front-facing stereo speakers and the HTC logo that was seen on all the earlier launched One M series devices. The image also shows the volume rockers and the power button placed on the right edge of the device while the front-facing camera and the notification light is put on the top. Apart from the image, no other details about the smartphone are revealed. According to recent rumors, the device is expected to come powered by all-new Snapdragon 820 quad-core SoC and may also include AMOLED display. The smartphone will feature a 5.1-inch QHD display, 4GB RAM, 32GB of built-in storage and also includes a microSD card slot for further expansion. Like the One A9, the smartphone will also include a fingerprint sensor embedded directly into the physical home button with support for virtual payments. It may also include a UltraPixel front camera with OIS, NFC support and is expected to run on Android 6.0.1 Marshmallow based HTC Sense UI 8.0 laid on top. Although there is no official word from the company, we advise you to take this with a proverbial pinch of salt. Stay tuned for more updates in coming days. To recap, HTC on Friday launched a new mid-range smartphone in its Desire series called as HTC Desire 626 Dual Sim in India priced at Rs. 14,990. The smartphone features 5-inch HD display, 64-bit MediaTek MT6752 octa-core SoC, 2GB of RAM, 16GB of onboard storage, 13MP primary camera, 5MP front snapper, 4G-LTE connectivity, NFC, 2000mAh battery and runs on Android 5.1 Lollipop out of the box.